ChessBrain is a virtual chess supercomputer using the processing power of Internet connected machines. On January 30th 2004 ChessBrain made history by becoming the first distributed network to play a game against a single human opponent. ChessBrain II is currently under development. The new design aims to be considerably more scalable. The ChessBrain project is powered by Open Source software, including the following key projects. Dr. Colin Frayn presented "ChessBrain II - A Hierarchial Infrastructure for Distributed Inhomogeneous Speed-Critical Computation" at CIG06 this morning. Our conference paper will be posted soon. The design for ChessBrain II was presented during the keynote presentation at LinuxForum 2005 by ChessBrain founder and co-developer, Carlos Justiniano. The presentation took place on October 8th 2005 and focused on how Open Source tools are being used to build distributed computation projects. The LinuxForum BoF (Birds of a Feather) conference included sessions discussing Grid and Cluster computing. The ChessBrain software is undergoing a year-long major rewrite. Our next release is designed to be massively scalable running on single processor machines to large compute clusters - and everything in between! For the first time, members will be able to build and operate their own local clusters! The Open Source msgCourier server is being used to power ChessBrain's highly distributed cluster software. msgCourier is a server application designed to radically simplify the construction of highly scalable distributed computing applications. ChessBrain is listed in chapter 12 "Beyond Desktop Computing" on page 664 under Grid Computing Projects. We're proud to see ChessBrain listed along side of other distributed computing projects such as ClimatePrediction.net, Distributed.net, Grid.org and QuakeSim. See the book's InfoWebLinks.com home page. ChessBrain announced today its official 2005 Guinness World Record as the World's Largest Networked Chess Computer. Read the press release and visit our world record site. The O'Reilly Network released ChessBrain founder, Carlos Justiniano's article on distributed computing. The article is based on lessons learned during the past three years working on ChessBrain, and examines how projects like ChessBrain are created. A brief follow-up article announcing ChessBrain's world record appears in the May 2004 issue of the Linux Journal. An article announcing ChessBrain originally appeared in the September 2003 issue of the Linux Journal. Carlos Justiniano announces ChessBrain's recent success on NewsForge, the online newspaper for the Linux and Open Source community. An article appears in the Los Angeles Times entitled, "ChessBrain No Pawn in Match With Human". ChessBrain's world record attempt was announced today on the world famous ChessBase website. The ChessBrain project announced today that it has successfully completed its attempt at establishing a new world record. The ChessBrain Network has become the first distributed network (of 2070 machines) to play a game against a single human player. To establish this new world record, ChessBrain only needed to complete a game, regardless of the games outcome. We're delighted that the actual game resulted in a draw. The ChessBrain project announces that it will make its first world record attempt at the 6th Annual NordU USENET 2004 conference in Copenhagen Denmark in a live exhibition game against chess grandmaster Peter Heine Nielsen. An article on ChessBrain, written by ChessBrain project founder Carlos Justiniano, is in the September issue of the Linux Journal. The Journal of the International Computer Games Association (ICGA) has accepted our paper on ChessBrain. You can read it here! ChessBrain is mentioned in Francine Brevetti 's two articles entitled, "Power sharing; Distributed computing moves beyond the search for ET"
and in "SETI set standard for linking millions of computers to share `brain power'". To read the articles do a site search for ChessBrain on the Oakland Tribune website. The British Chess Federation displayed a short news bulletin stating that Peter Wilson has joined the project and briefly described our project's goal. 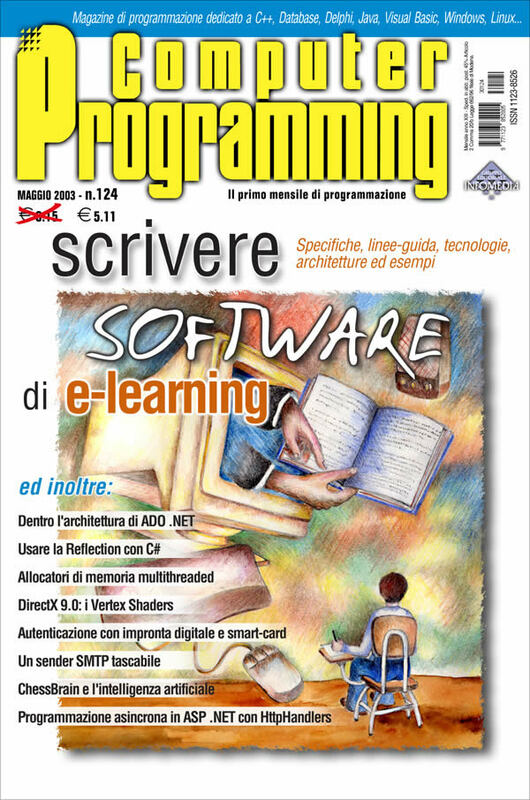 ChessBrain featured in Italian magazine "Computer Programming"
Alessio Malizia from Italy wrote an article for the Italian magazine "Computer Programming". We don't have a translation of the article at this time, however we do have the front cover. California Computer News published an article on ChessBrain by Matson Breakey. Esteemed chess organizer, Peter Wilson joins the ChessBrain team! Read the exciting press release. ChessBrain has been announced on the World Chess Federation's (FIDE) website! We consider this both an honor and a milestone for the project. ChessBrain was featured on the front page of a German news site, Heise online in a brief article. The article created a wave of new PeerNode operators which has introduced over 300 CPU new processors! ChessBrain has been featured on the front page of Linux.com and on NewsForge, the online newspaper for Linux and Open Source, in an article by Tina Gasperson. On Tuesday Dec 17th 2002 ChessBrain showed early signs of life. The entire system played its first complete games of distributed chess. Our current results exceed our stage two expectations. Read more. You may view the actual games. ChessBrain was mentioned in the German "Linux User" magazine. We've officially announced our intent to go for the first world record involving a distributed network devoted to playing chess. Tony Hedland mentions The ChessBrain Network in his July 31st issue of his ComputerChess newsletter which is featured in the "Man and machine" column on the Garry Kasparov website, and the mention appeared on that site! Just in case you're new to chess... Garry Kasparov is considered by many to be the best chess player in the history of chess. Computer 'ChessBrain' Is Learning Right Moves. That's the headline on an article featured in today's edition of the LA Times. An interview with ChessBrain founder Carlos Justiniano on KCLU-FM's by News Director Lance Orozco. This morning at 34 minutes past each hour, ChessBrain was featured on the Morning Edition radio program. ChessBrain has been listed on O'Reilly's OpenP2P Directory. This helps to put the ChessBrain project on the Peer-to-Peer Distributed Computation and Infrastructure map! O'Reilly is one of the most respected technical publishers and conference organizers on the planet. It's quite an honor to be listed among DC projects such as Distributed.net and SETI. The ChessBrain Project has been slashed! ChessBrain appeared on the front page of Slashdot.org (The supreme nerd news site) last Sunday.